The Seventh-day Adventist Church in British Columbia was officially organized in 1903. One year later the first school opened in Pitt Meadows. 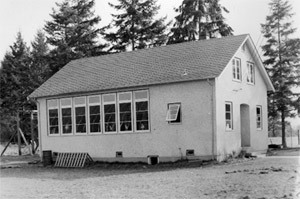 Schools in Lumby, Bella Colla, Grandview, Nanaimo and Penticton also began operation in the early 1900s. Some schools like Penticton opened and closed several times over the years while others like Nanaimo, Rutland and Rest Haven moved or became consolidated with other schools. Several of these moves or consolidations resulted in name changes. Probably the two most unique schools were those at logging camps at Butedale (Owens’ Logging Camp and Gildersleeve’s Camp) on Princess Royal Island in the Inside Passage. Both were constructed on rafts of huge logs. One was situated on the beach and the other in about fifteen feet of water. The playgrounds were on various floats of the logging camps. There have been times during the past century of Adventist education that only four to six schools were in operation. The Grandview School (now North Okanagan Junior Academy) is the only continuously operating school during this time. About 1100 students attend the fourteen schools currently operating in our system. Please refer to “Schools“ for a full list of school names and locations.